To listen the sermon PRESS THE ORANGE BUTTON! Download the sermon on PDF here. Grace to you from God our Father and our Lord and Savior Jesus Christ! Today we have for our meditation Jesus baptism, temptations and preaching. Let’s see how these words of Mark shape our understanding about Jesus and about us as Jesus’ disciples. What would you say, if I asked you, what do you like in Jesus? Why do you like Jesus? Assuming that there is at least something in Him that you like. Another way to put it would be – what picture, what image of Jesus do you like? You may have your own answers, but very often people are pretty much like Jesus’ closest disciples. They really enjoyed being together with their Teacher. For He was an amazing guy. The things that He could do, it was mind blowing. No one could do what Jesus did. Such power, such might, such miracles. Nature obeyed Him whenever He commanded it, sicknesses and demons, even death. They all had to submit when Jesus spoke to them. He obviously was the Son of God with divine power. Feeding four thousand, feeding five thousand, raising up Lazarus, and so on. Jesus disciples loved to be together with Him. He was invincible and they felt a little bit like that when together with Him. Who would mind to experience it?! His wisdom. How many times Jesus adversaries tried to catch Him in His words, but every time Jesus wisdom was much more superior and He always left their disputes as a winner. To be honest, who wouldn’t want to be together with Him? These are things which make us excited when we think about Jesus. This picture, this image of Jesus is what so many people really like. Then we want to be like Him, triumphant over our adversaries, boldly achieving our goals. Being super-Christians, doing things like our Teacher did. Who wouldn’t love to be super successful as Christian, with Jesus help of course. When we could make things happen: people returning to Christ whenever we invite them, congregations growing, new members steaming is, our different ministries flourishing, so that people around us see how fruitful our activities are. Who wouldn’t want this glory? For the sake of the Gospel, of course. But Mark in these verses which we read today portrays quite different Jesus. Very different. Passive Jesus. He didn’t do much. Yes, He came from Galilee to be baptized, but then, that’s it. That was John who did the baptizing. Jesus simply received it. 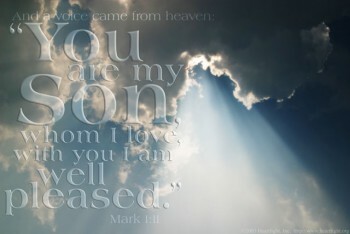 That was the Father who spoke to Him from heaven. Jesus simply listened. That was the Holy Spirit, who drove Him into the wilderness. That was Satan who was tempting Jesus. These were angels who served Him, and wild animals who accompanied Him. Jesus was rather passive. Instead of being in control and doing things Jesus simply received what was done to Him. He was simply obediently receiving what was done to Him. What to make of it? Why was He so passive? To be able to understand it, we need to ask this question – what really defined Jesus ministry? What was the very heart of His ministry? Miracles? Feeding of thousands? Healing of thousands? Raising the dead? Rebuking the storm? Did Jesus come to surprise everyone by His abilities? Was this the reason for His incarnation? When Jesus was about to ascend into heaven He instructed His disciples and sent them as His witnesses to all nations. The apostles put together the most important things that we need to know about Jesus ministry, and you know what they are. We say them every time, when we come together in God’s presence. “Conceived by the Holy Spirit, born of the Virgin Mary, suffered under Pontius Pilate, was crucified, died and was buried…” This is how Jesus life is summarized. We want glory and fame… yes, the things of men. They are so sweet. They make us feel so good. Of course, we want this glory for doing something good and noble, and useful. To be seen and noticed how wonderful people we are. This is how we can understand Jesus passivity. From the very beginning of His ministry He learned obedience to the Father through temptations and sufferings. Beginning with His baptism, being led into the wilderness, being tempted throughout His ministry. In all of this He denied Himself and lived for others. And when did it happen when He was made perfect in His obedience? When did His obedience earned eternal salvation for us? On the cross. Sacrificing Himself for us. So that you could live. This is how Christ showed His love towards you, and His obedience to the Father. Denying Himself for your sake. Putting Himself aside and considering you more important than His own life. Now, what can we learn from this? What does it mean for us? If we want to be Jesus disciples, then the first that we need to learn is obedience to the Father. This is the first, and the most difficult one. Our mission impossible. Why? Because no one wants it. We don’t want to be obedient to God. First, we think that we know things better. At least we know what we want, even if we don’t know what we need. What He says may not correspond to what we want. So why would we listen to God? And even if it seems that sometimes He may be right, still, we so often want to go our own way. Instead of being obedient to God, we want to be like god’s ourselves. We want to be in control, we to be in charge. We want to decide what is right and wrong. Jesus learned obedience. Jesus! How much more do we need it? To learn to be humble before God and not to come before Him with our own demands. For this is what we want so often. We want God to do what we want. We want His church to do exactly what we want, to be like we want. For we know better. Jesus learned obedience. Obedience to God begins with listening to God. Listening to what God is speaking to you in His word. Listening to Him in the Divine Service, listening to Him reading the Bible, in home devotions or in Bible studies. Trying to understand what God’s will and what His attitude towards you is. There cannot be any obedience to God if we event don’t know what God is speaking to us. But how few are those who want to listen to Him! How much more are those who are too busy, or who know everything already, who are smarter than God. How much more are those who want to listen to other authorities, other gods, but primarily to themselves. But what happens to those who want to be obedient to God, who want to listen to what He speaks to you? Those few receive the Holy Spirit, and joy and peace and wisdom. For where is the Word, there is the Holy Spirit. Thus by listening to God you receive the Holy Spirit and many of His gifts. But, where is the Holy Spirit, there are also – temptations. Yes, that’s right. This is how things are for Christians in this world. Once you listen to the Lord, once you receive the Holy Spirit, once you want to live in obedience to the Father, you become very dangerous for the chief adversary of Christ – Satan. And he will not want you to enjoy peace and joy without troubles. He will be on your neck right away, he will be coming for you, he will do His best to test you, to temp you, to make you suffer if possible, so that only He can turn you away from the word, from listening to God. It may sound scary, it is inevitable, but it is also good. For this is when God actually shapes us and makes of us something good and useful. You know from your own experiences, – what situations make you stronger? Easy life or challenges? Of course, challenges. As soon as we start to listen to the Lord, and want to change our lives, Satan will attack, in one way or in another. He will try to make you focus on your troubles, instead of focusing on God. If he can make it happen, if we forget about God and focus on our problems, Satan will use it to alienate us from the Father. That’s why it is so, so important to remember – where do we need to run for help? That’s right, back to Christ and the Holy Spirit. This is how God the Father shapes us and makes us stronger. In fact, we can say that He makes Satan to work for Him and for us, for if we are clear about what is happening, and we look for help to the Father, we grow stronger and stronger in our Lord. This is how we need to look to temptations and struggles. Imagine that you are a block of marble, and God is a sculptor. If He wants to make you into something beautiful, He need to chop away anything that is obstructive. He can’t do it by nursing us, He needs to make some hard hits. But all of this is a part of creative process where we are made into God’s people. This is how He prepares us for our mission. In obedience to Him, listening to His word, tempted and tested by the adversary, strengthen by His Spirit – He prepares us to live for others, to have the mind of Christ, in humility counting others more significant than ourselves. So what can we learn about us? What does it mean for us Christians? It is not about doing big things, it is not about our glory. It is not about us at all. It is about our God the Father and the Son and the Holy Spirit and about our neighbour. It is about God doing things for us and through us. We simply receive what He has prepared for us, and then use all of it to serve our neighbours. When you take your crosses, whatever they are, they are much lighter for Jesus carries them with you and the Holy Spirit descends to help you, and angels are around you to serve you. This is how things are for us, Christians. I think this could be a worthy goal for this Lent season, and not just for this Lent, for the whole life: give up yourself, listen to the Lord carefully, be ready for Satan’s temptations, and experience how the Father lovingly shapes you in the midst of this life’s troubles.